There are many intersections in San Francisco’s South of Market neighborhood where freeway on- or off-ramps intersect city streets. Many of these ramps are located close to public schools, single room occupancy hotels, and senior centers, which are frequented by populations at high risk of injury from traffic collisions. The Transportation Authority has been studying how to improve safety at 15 of these intersections with support from Caltrans and the SFMTA. The goal of these studies is to improve safety for all travelers, especially the most vulnerable populations, and to support progress towards the City's Vision Zero goal to eliminate traffic fatalities by 2024. There are 22 intersections in SoMa where freeway on- or off-ramps intersect city streets. This map shows all of the projects and plans that are underway at each of these intersections. The Transportation Authority has been working to improve safety at 15 of these intersections. The remaining seven intersections are part of planning efforts led by other local agencies. The Transportation Authority and the SFMTA developed recommendations for improving safety at five initial intersections. The study was initiated in May 2016 and completed in early 2018. The SFMTA is including improvements at these intersections in its latest five-year Capital Improvement Program update. The Transportation Authority and the SFMTA are developing recommendations for improving safety at 10 additional SoMa intersections. This study is active and on schedule with the below timeline. Introduce study (spring 2018): The project team introduced the study to the community and asked for input on potential improvement ideas. Draft improvements (spring 2018): Planners conducted a detailed collision analysis at each intersection and proposed intersection improvements. Present improvements to community (summer 2018): The project team gathered feedback on the proposed improvements. Incorporate feedback (fall 2018): The team refined and analyzed the improvements based on the study goals and community feedback. Present final concepts (spring 2019): The team will release its final report and seek funding to implement the improvements. The study was funded in part by the Transportation Authority's Neighborhood Program. This study was funded by a Caltrans Sustainable Transportation Planning Grant and San Francisco’s half-cent sales tax for transportation. Emphasis on safety: We prioritized intersections with high collision rates. Coordination with other agencies: We focused on intersections that aren’t already being addressed by other City plans and projects. Proactive approach: Some intersections did not have reported collisions, but were selected because they have opportunities for proactive safety improvements (e.g. new or upgraded crosswalks). The Transportation Authority and the SFMTA have developed recommendations for improving safety at the following five freeway ramp intersections in SoMa. The Transportation Authority received Caltrans grant funding to evaluate 10 additional ramp intersections in SoMa. The Transportation Authority and SFMTA are currently studying the additional intersections and developing recommendations for improving safety at these intersections. Over a recent five-year period, these 10 intersections have had more than 135 collisions, of which 9 had severe injuries. In addition, all 10 intersections are on the San Francisco's Vision Zero high-injury network of streets in the city that have disproportionately high numbers of traffic injuries and fatalities. Proposed improvements for the 10 intersections include bulb-outs, signal improvements, crosswalk upgrades, striping improvements, and more. We are focusing primarily on near-term improvements that could be on the ground in the next few years, although some bigger ideas might take longer to plan and implement. The SoMa Freeway Ramp Intersection Safety Studies follow previous Transportation Authority involvement in efforts to improve safety at SoMa freeway ramps. Before Freeway Ramp Intersection Safety Studies 1 and 2, the Transportation Authority led design and construction of the Folsom Street Off-Ramp project to realign the I-80 off-ramp to Folsom Street in collaboration with Caltrans, the SFMTA and SF Public Works, the Transportation Authority led design and construction of the Folsom Street Off-Ramp project to realign the I-80 off-ramp to Folsom Street. The new off-ramp features safer conditions for pedestrians while creating a significantly more valuable parcel of land that allowed for development of new retail space and housing, more than one-quarter of which is affordable. 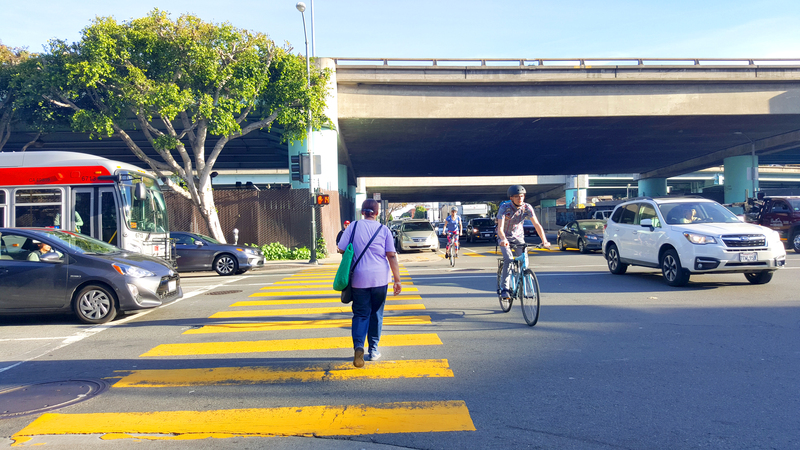 The realigned Folsom Street off-ramp allowed for the creation of a new crosswalk, designed to help the flow of pedestrians in an increasingly residential area of downtown. The new crosswalk, which allows pedestrians to cross the off-ramp where it meets Fremont Street, has an actuated pedestrian crossing phase. A pedestrian seeking to cross the off-ramp uses a push-button to activate the pedestrian crossing signal while the off-ramp traffic has a red signal. At all other times, the off-ramp traffic will have a green signal. The new off-ramp reopened to traffic in 2015. Freeway Ramp Intersection Study 2 has since recommended the addition of further treatments to the new off-ramp intersection to further improve safety and pedestrian access. The project team spent spring of 2018 gathering feedback by meeting with the community and collecting more than 800 surveys. The team then conducted an in-depth analysis of each intersection and shared draft improvements at an open house on July 31, 2018. What’s next for Study 2? The project team refined and analyzed the improvements based on the study goals and community feedback. The team will release its final report and seek funding to implement the improvements in winter 2019. San Francisco’s Communities of Concern include a diverse cross-section of populations and communities that could be considered disadvantaged or vulnerable now and in the future. The SFMTA’s Folsom-Howard Streetscape Project will make it safer and more pleasant to walk, bike, shop and live along Folsom and Howard streets.